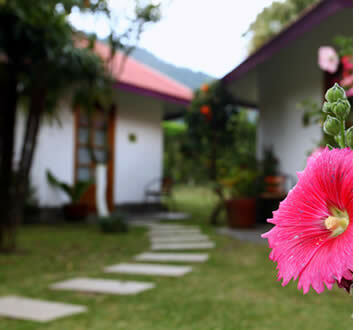 Isla Verde Roundhouses Inn: six cozy roundhouse cabins, four contemporary suites and two modern apartments in the middle of a lush tropical garden with beautiful cloud forest flowers & a sparkling mountain stream surrounding the whole. Boquete Garden Inn: gorgeous riverside boutique hotel with five guest cabins, each with two bright and airy welcoming suites. 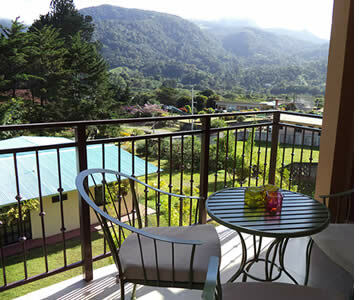 Combines beautiful & serene natural surroundings with comfort and modern convenience. Included in Frommer's Best of Panama. Simply perfect if you fancy being just out of town. Casa de Montaña: an intimate boutique bed & breakfast with 6 rooms and great customer service located in the outskirts of downtown. Still can't make up your mind? Check out this blog post about our favorite midrange lodging options in Boquete, Panama... Only Habla Ya Spanish Students are eligible for the special rates for extended stays that appear on this page when they make their reservation through us. These special rates are offered to our students due to the amount of traffic that we generate for these hotels. Most of our recommended lodging options are located within walking distance to our Spanish school in Bocas del Toro (from 1 to 15 minute walks). TripAdvisor: Travelers' Choice 2012, 2013, 2014 and 2015. 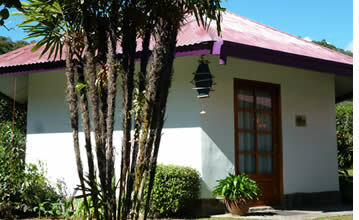 Top 5 B&B & Inns in Panama. Top 25 in Central America. 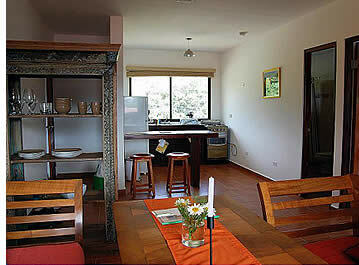 The most 5 star reviews of any accommodation in Panama! This riverside bed and breakfast is the perfect place to study... or to relax and unwind! Take in the beauty of the stunning flowers in bloom. 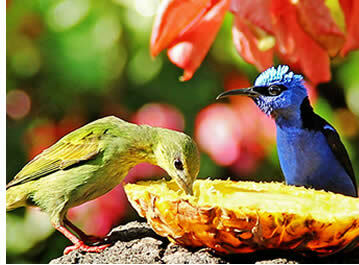 Marvel at the variety of brightly colored tropical birds that visit each morning for breakfast. Explore secret gardens and discover the cinnamon, coffee, eucalyptus and orange trees. Gently sway in a hammock and lose yourself in the pages of your favorite book. Take a quiet moment or two to enjoy the riverside gazebo or simply sit back and allow the river to calm and soothe your soul. Picture yourself at Boquete Garden Inn and then come prepared to experience something even more magical. 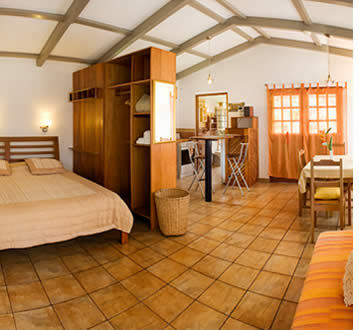 Boquete Garden Inn has five cabañas with two guest rooms in each (each with their own private bathroom), creating a warm cozy setting, while offering privacy. The newly renovated rooms are bright and airy, featuring local and exotic artwork, handcrafted woodwork, new mattresses and plush duvets. Each room is equipped with 32" LCD TV, free Wi-Fi, kitchenette or full kitchen, dining area, laptop safe, microwave, fan and hairdryer. The remodeled, contemporary bathrooms have hot showers, and dehumidifiers are rotated between rooms for optimum comfort. Experience "breakfast with the birds" between 8:00 a.m. - 10:00 a.m. A variety of tanagers, honeycreepers, hummingbirds and more visit every day! Meet fellow guests at Boquete Garden Inn's own riverside gazebo bar for social hour, every day between 6:00 p.m. - 7:00 p.m. Continental breakfast with local fruits, eggs and fresh-baked bread of the day is offered each morning on the patio and can be purchased for $3 - $5. Boquete Garden Inn offers the "Habla Ya discounted rate" on three types of accommodations: a Queen room, with Queen bed and single bed, kitchenette and dining area. Family room, with Queen bed and bunk bed (for families with children 10 years and up), kitchenette and dining area. 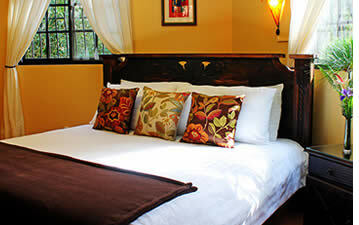 And a King Suite, with separate bedroom with king bed, full kitchen, living area and pull out double bed. As there is a very high demand for Boquete Garden Inn, these discounted rates are only available during low season (specific dates below). 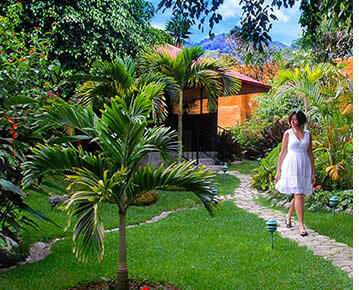 Boquete Garden Inn artfully combines the beauty and serenity of its natural surroundings with comfort and modern conveniences. 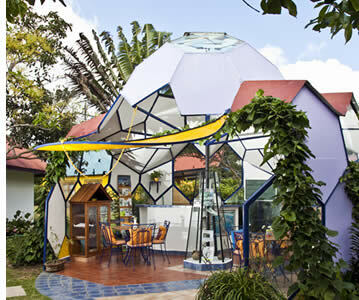 Included in Frommer's Best of Panama ("...Very cozy, offer plenty of space... The beds... are feather soft and fitted with fine linens and duvets. It's quite a deal for the price..."), Boquete Garden Inn was rated as one of the "Top 9 Small Hotels and B&Bs in Panama" and comes top-rated from TripAdvisor! Every single year Boquete Garden Inn manages to be chosen amongst the top hotels in Panama on TripAdvisor. If you would like to experience Boquete Garden Inn for yourself, click here to make your reservation today! 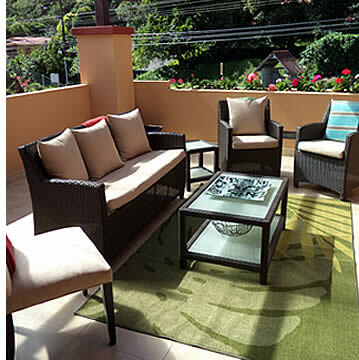 Casa de Montaña is located on the outskirts of downtown Boquete in a beautiful and safe neighborhood and an easy 30-minute walk from Habla Ya Boquete. You'll be close enough yet far enough from the hustle and bustle of downtown Boquete - ideal location for you to be able to study and enjoy Boquete. This boutique B&B is located within a modern, state-of-the-art home that has two water features, which perfectly add to the peace and tranquility that you're looking for - one in front of the home and the other on the side close to the private seating for one of the bedrooms. Casa de Montaña also has two fireplaces - one on the back terrace and another one in the bar upstairs. During Boquete's fresh nights, nothing beats having a warm fire where you can sit down, relax and enjoy a fine glass of wine. With only six different rooms available, you'll be sure to receive a personalized service. This B&B is owner run, who live at the home in their own section of the house and take a personal interest in getting to know each of their guests and their own individual needs. Without any doubt they can also make recommendations to you as their guest about how to make your stay in Boquete a much more full and rich experience. 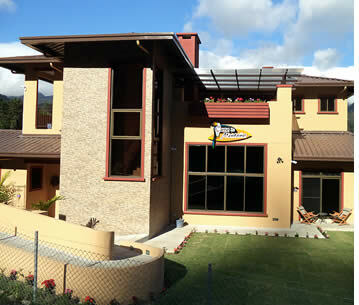 Bajareque is located in the front of the home right by the beautifully landscaped garden with a water feature. Baru is located on the south side of the home and has its own private, beautifully landscaped garden with a water feature as well Baru's bathroom also has a jetted tub. Guests staying at both Baru and Bajareque will have their own outside access to the room and both rooms are handicapped accessible too. 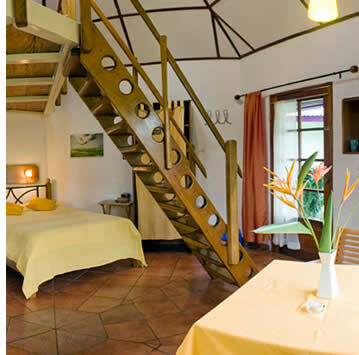 Caldera and Mola are located on the second floor, both with a view of the Alto Lino Mountains from their own private balconies and are ideal for two people. 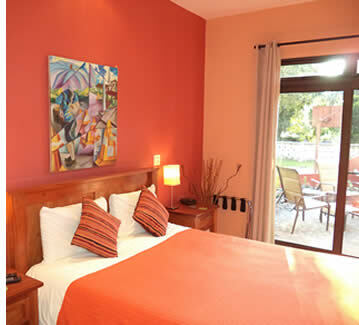 Quetzal and Tucan are the two largest rooms at Casa de Montaña, both located on the second floor too and both have beautiful views of the Alto Lino and Jaramillo mountains. 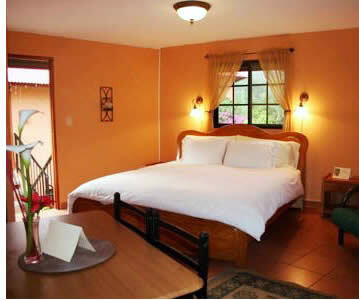 Tucan is the most private room at this B&B as it's located at the far end of the floor. Quetzal also has a large corner balcony. Each room at this Bed & Breakfast has its own private bathroom and comes equipped with queen sized beds, memory foam mattresses and pillows (every student needs a good night's sleep to function! ), refrigerator, microwave, French press, hot water kettle, rain shower heads, Wi Fi, Flatscreen TV, DVD player, alarm clock, programmable safe, ceiling and pedestal fans, dehumidifier, and plenty of closet space for a longer term stay. The housekeeping services are included as part of the rates. The gardens have been landscaped with tropical plants as well. With plenty of seating/lounging areas for you to enjoy, you can either study in your room, since each room has a custom designed desk, or out on your private balcony/terrace or any of public terraces around the home. Having opened in January 2014 Casa de Montaña has already been rated as one of the top B&B & Inns in the Boquete area on TripAdvisor. 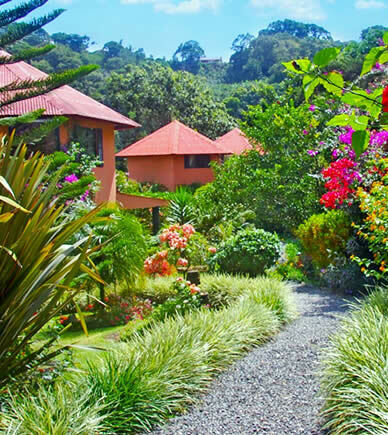 A home away from home Casa de Montaña was picked by its former guests for the TripAdvisor "Travelers Choice Award" and made the list of of the top five B&Bs in Panama for 2015. Since Casa de Montaña is a small Bed & Breakfast, they do their best to give you personalized attention. Each day of the week has a different breakfast so if you stay a whole week, you'll experience the seven different meals (from Italian, French and Belgium to American, Mexican and Panamanian, for only $6 per person). Please check out the two videos below – one of them brings you through Alto Boquete and Boquete Downtown all the way to Casa de Montaña Bed & Breakfast and the other one shows you around the property so you can get a better feel for the place. * Please note: prices are in US Dollars. Rates DO NOT include Panama's 10% Hotel Tax. The discounted rates shared above are only for Habla Ya students and cannot be combined with any other discounts. During High Season these rates are not available: November 1st to April 30th. The rates are based on no more than 2 people to each room. Low season: May 1st to October 31st (excluding Panamanian National Holidays). The rates for more than one week do not include the International Breakfast or a beverage during the Social Hour. With a 24-hour advance notice, the International Breakfast may be purchased for $6 (plus tax). Stays of one day to six days require a one day non-refundable deposit. Since the longer term stays of week or longer are heavily discounted, a 50%, non-refundable amount is due upfront upon reservation and the rest is due upon Check-In. How did we come up with a list of hotels? Amazing enough Boquete is home to several prestigious and internationally renowned chefs and there are plenty of gorgeous restaurants in Boquete. Visit our Boquete Info section where we have a list of Boquete's restaurants so that you can start imagining the feasts that you'll be able to enjoy in Boquete.